RAPAPORT... Firestone Diamonds has recovered a 326-carat, near-gem-quality rough — the largest diamond the miner has found to date. The company unearthed the stone at its Liqhobong mine in Lesotho in October, it reported last week. “[The 326-carat diamond] provides further evidence of Liqhobong’s large-stone potential, and, importantly, the ability of the treatment plant to recover larger stones intact,” Firestone CEO Paul Bosma said. The discovery followed sales of $13.5 million in the first fiscal quarter ending September 30, in line with the same period last year, it added. Strong sales volumes partly offset the negative impact of weak prices for smaller, lower-quality rough at the one sale Firestone held during the quarter, it said. While the average price of $70 per carat at that September tender — from sales volume of 194,206 carats — was higher than last year’s $69 per carat, it was still below the company’s expectations. Prices improved at the October tender, Bosma noted. “We completed our second sale of the financial year [following the end of the quarter], and, pleasingly, the strong demand for our special stones offset the continued pricing pressure on the run-of-mine stones, resulting in an improved average value realized of $79 per carat,” the executive added. Production rose 21% year on year to 240,733 carats for the first fiscal quarter despite snow-induced delays, with the miner recovering 114 stones weighing more than 10.8 carats each. The equivalent period last year was Liqhobong’s first full quarter of commercial production. 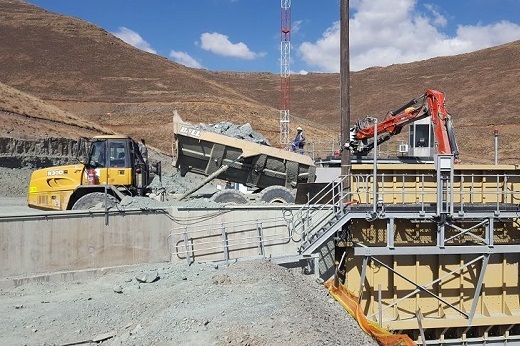 Firestone, which owns 75% of Liqhobong in partnership with the Lesotho government, is in the process of evaluating its mine plan and determining whether it is viable to extend the asset’s current life span.